The term “robot swarm” has a rather menacing tone to it, but large groups of tiny robots are on the forefront of robotics research. Working together, hundreds or thousands of little robots could do things that one or two large robots never could. 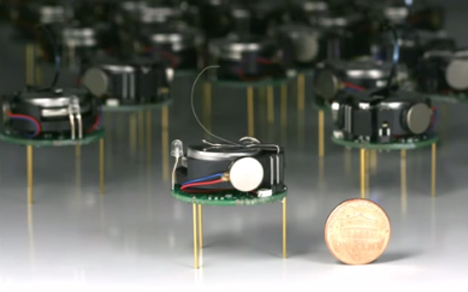 Mike Rubenstein, an engineer at Harvard, was part of the team that invented Kilobots: itty-bitty robots that can be controlled as a swarm with a single command. The little bots look a lot like the tiny aliens in the movie ‘Batteries Not Included’ (sans the abilities to fly, convey emotions, or tug at heartstrings). They are about the diameter of a quarter and rest on three thin metal legs. Each sports a cute little metal spring on top. Rubenstein’s ingenious method for charging his swarm of 1,024 Kilobots is to push them up against a long charging rack. Two of their legs and the top spring have to touch the rack in order for the bots to recharge. Once juiced up, the little guys are ready to do the engineers’ bidding. They can be ordered en masse with a single command to take any solid form, though it takes up to 12 hours for them to complete that form. The Kilobots aren’t just an adorable novelty act; they could be used in the future to search collapsed buildings for survivors, scout dangerous territory for military missions, or even act as self-assembling building blocks to form mission-essential equipment in space. One of the biggest challenges so far has been producing robots that are inexpensive as well as effective. In order for robot swarms to be practical, they have to be affordable in large numbers. In their current form, Kilobots cost around $14 each just in parts. The need to limit the cost also results in the need to limit their functionality, as adding more functions would of course increase the price of each bot. But the Kilobots aren’t intended to be a solution to the question of how to utilize robot swarms; they are simply a step forward in the quest to produce tiny robots that do our bidding on command, and they’re a pretty amazing advance in the robot swarm arena. See more in Robotics or under Technology. August, 2014.